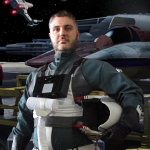 Once again this year, Rebel Legion Italian Base and 501th Italica Garrison will be the stars of the Sci-fi Area at Cartoomics in Milan, one of the most important comic conventions in Italy. This year the area where we will be setting up will be themed as Tatooine, one of the locations most dear to the fans of the saga. We therefor invite you at this event and you would be more than welcome to take part with us to this convention. For whoever will be present we provide free entry to the convention, changing rooms and can stay at the Hotel right in front of the event hall! We ask you to inform us of your interest before the 21th of February. For every other question or detail please contact our BCO or BXO!